The Youth Enterprise with Innovation in Nigeria (YouWiN!) Programme is an annual Business Plan Competition (BPC) for aspiring young entrepreneurs in Nigeria. In line with the Federal Government’s drive to create more jobs for Nigerians, the programme aims at job creation by encouraging and supporting aspiring entrepreneurial youth in Nigeria to develop and execute business ideas. On Monday September 3rd 2012, President Goodluck Jonathan launched the 2012/2013 Edition of the YouWiN! Business Plan Competition tagged “YouWiN! Women”. The first round of the entrepreneurship competition was held last year, open for aspiring entrepreneurial youths in Nigeria. The second edition of the business plan competition aims to empower women. The competition is open for aspiring entrepreneurial Women. Award recipients must be registered with CAC before disbursement of funds even though they do not need to be registered to apply. 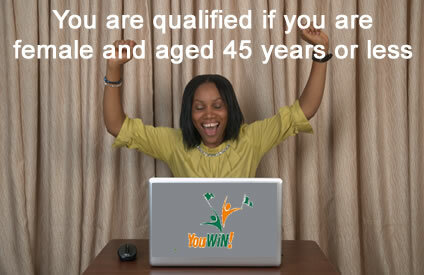 YouWIN will support the registration process. Award recipients will operate accounts using their registered companies with any of the participating commercial banks prior to disbursement. Award recipients must sign a grant agreement with the managers of YouWiN before disbursement of funds. The main objective of the You WiN! Programme is to generate jobs by encouraging and supporting aspiring entrepreneurial youth in Nigeria to develop and execute business ideas that will lead to job creation. The programme will provide aspiring youth with a platform to show case their business acumen, skills and aspirations to business leaders, investors and mentors in Nigeria. Step 2 - Register Now at the YouWIN website. You will receive a confirmation email from YouWIN! with all the details you will need to log in. Step 3 - Once you have successfully registered you need to Log in and click the New Business Application button on the right hand-side. You can save your application form as you go along, and come back to it at any time. Once you are happy with your application use the Submit button on the form to send it to us. You can submit only ONE application. After the closing date you will be notified if you have been selected for the next stage of the competition. You can join the discussion on the forum, or on Facebook and Twitter. We will also post news on the YouWiN! homepage. Mon. Sep 3, 2012 -- First stage business concept submission starts after launch by President Goodluck Jonathan. Sun. Oct 14, 2012 -- First stage business concept submission closes. No entries accepted after this date. Mon. Dec 10, 2012 -- Training of the 1st set of second stage candidate starts. Trainings will be held in sets on 10 - 21 December 2012 and 2 - 11 January 2013. Mon. Dec 10, 2012 -- Submission of second stage business plan starts on 10 December 2012 and ends 8 February 2013. Please note that only entries from candidates who attended the training and had their biometrics information collected are eligible and will be reviewed. Wed. May 1, 2013 -- Winners are notified and published on website and major national dailies.